Martin Luther King and the movement for civil rights in America are inextricably linked. Born in Atlanta, Georgia to a Baptist minister father and schoolteacher mother he would become the voice of the movement heard by millions of people around the world. Martin Luther King Jr. was born on 15 January 1929. Skipping ninth and twelfth grade at Booker T. Washington High School he eventually graduated Morehouse College in 1951 with a Bachelor of Divinity Degree. King received a Doctor of Philosphy in 1955. During his years at Morehouse College King became influenced by Howard Thurman, a civil rights leader. It was thought that Thurman’s influence spurred King on, shaped his ideology and formed in King the idea of non-violent protest. King eventually returned to Montgomery, Alabama to become a Baptist pastor, and 1955 was a year that saw the civil right movement come into action. Rosa Parks a young seamstress was arrested after refusing to give up her seat on a bus to a white man. King took charge of the situation and organised protests that led to the boycotting of all public transport. The boycott would last 382 days in total and eventually the Supreme Court would determine that this segregation was unconstitutional. King was instrumental in forming the Southern Leadership Christian Conference (SLCC) in 1957. The SLCC was dedicated to non-violent protest against discrimination. King had been influenced by the non-violent principles that Ghandi had used against the British in 1947 to gain independence for India. Throughout his life King adhered to the principles of non-violent protest as a means to fighting segregation and discrimination. Other civil rights activists such as Malcolm X who would use more incendiary methods of protest would eventually come to the same conclusion as King on the positive use of non-violent protest. In 1963 America had reached boiling point where racial discrimination was concerned. Peaceful civil rights demonstrations around the country were turning violent as the authorities used any means necessary to break up the protests. Birmingham, Alabama saw a number of demonstrations that year including peaceful protests to end segregation at lunch counters, swimming pools, restaurants and other public places. Most of these protests ended with police using severe force on the black demonstrators including police dogs, tear gas and electric cattle prods. Huge numbers of demonstrators including children were arrested along with King himself. The March on Washington for Jobs and Freedom was a defining moment in the civil rights movement, and one that brought the abuse of Africa-American’s civil rights to the attention of the world. America and President John F. Kennedy had been shocked by the violence used against peaceful demonstrators and Kennedy proposed a bill that would outlaw racial discrimination and segregation. The historic March on Washington took place on 28 August 1963 with more than 200,000 people attending to show their support of the proposed legislation. The March on Washington ended with Martin Luther King Jr’s famous “I have a dream” sermon. The speech has been described as one of the most important speeches in America’s history and was heard by millions around the world. 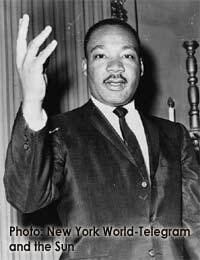 King was introduced as, “The moral leader of our nation” and talked of a world without discrimination where freedom and equality would be a right for all Americans. King’s passionate and inspiring speech would show him to be one of history’s greatest orators. In 1964 King became the youngest ever recipient of the Nobel Peace Prize for his work for non-violent protest to end racial segregation and prejudice. King now focused his efforts on gaining equal voting rights for African-Americans. After many demonstrations, many of which ended with the deaths of demonstrators, the Voting Rights Act protecting the voting rights of blacks was eventually passed through congress. Martin Luther King Jr. was assassinated on 4 April 1968 during a visit to Tennessee. His final campaigns were aimed at ending poverty and ending the Vietnam War. King was truly one of the icons of the civil rights movement and a major force in helping to wipe out racial abuse and prejudice in America and around the world. janoskians are on the case !!! i am very concerned that 2 people have been spying on me on your website. please ban them. Thank You ?